Most recently, the makers of Rogaine have introduced a Men’s Rogaine Foam—the first and only foam product approved by the FDA to regrow hair. 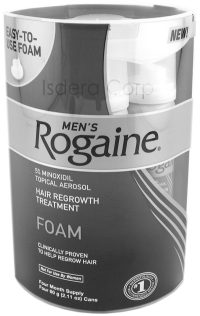 Rogaine foam has the advantage of not having several irritating chemicals that may make it less greasy. Unlike Rogaine solution, the foam does not have propylene glycol, an agent that commonly causes irritation and may even cause an allergic contact dermatitis. The incidence of chronic itching was 1.1 percent versus 6.6 percent seen in a separate study using Rogaine solution. With respect to Rogaine foam versus the generic solution, the foam is relatively easier to use and some professionals think that the foam is possibly more effective because of the delivery mechanism. The foam produces better compliance amongst Rogaine users. A survey was done among hundreds of men which found that Men’s Rogaine Foam was overwhelmingly preferred vs Rogaine solution. Possible advantages of Rogaine foam are: ease of application, lack of dripping, quick absorption and drying, and ability to fit easily into a daily routine. In the Journal of the American Academy of Dermatology, a team of researchers report results of a clinical trial in which 315 men with hair loss were randomly assigned to 5% Rogaine foam or a placebo foam. After 16 weeks, hair counts in the target area were significantly greater in the 164 men applying Rogaine foam compared with the 151 men applying the placebo foam. With Rogaine foam, there was an average increase in hair counts of 13.4 percent over initial counts, compared with an average increase of only 3.4 percent with placebo. Moreover, men using Rogaine foam noted an average 70.6 percent increase in hair growth versus 42.2 percent of men on placebo. Make sure that your hands are cold when applying Rogaine foam. Otherwise, the foam will melt, and will be so similar to solution form. So just rinse your fingers in cold water before applying the foam.